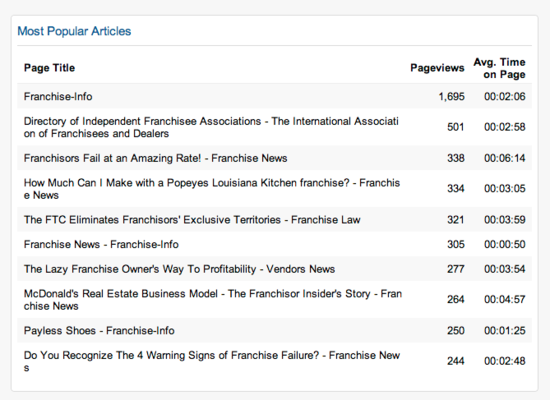 Here are the Top Influencers, as determined by LinkedIn, in the Linkedin Groups that Franchise Info manages. Each week individuals contribute their comments and ideas to our LinkedIn Groups. LinkedIn uses an algorithm to select whose comments & ideas have the most influence. We don't report the group owner's influence ranking. Unfollow John A. Follow John A.
Congratulations to Dale Waite & June M. Toth. Unfollow June M. Follow June M.
Professional Speaker and Marketing Consultant Referred to as a leading authority on marketing and communication. Congratulations to: Matthew Kreutzer & Mary Clapp. Congratulations to: Eric Gustafsson, Sandra K. Jimmerskog, Howard Kline, Esq. Unfollow Sandra K. Follow Sandra K.
6. 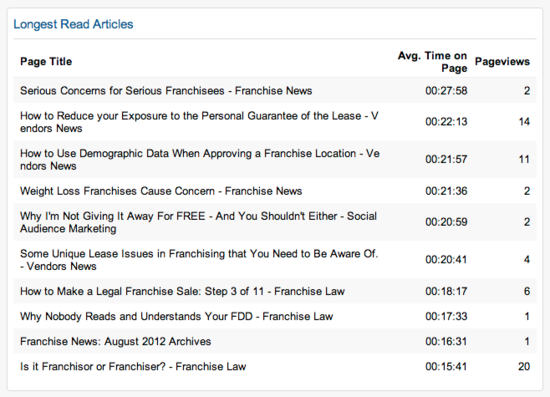 Finally, here are the Top 10 Stories - determined by Google Analytics- by popularity and time spent. Congratulations to Richard Solomon for the most Popular Article & Bob Canter for the Most Engaging Article. If you believe that you are deserving of being an Influencer & want to Get Your Name Out There, take a Look into the Franchise Info Marketing Program .